The United States of America (often called the United States, the U.S., the USA, or America) is a federal constitutional republic made of fifty states and a federal district. The forty-eight contiguous states and Washington, D.C., the capital district, are in central North America, between the Pacific and Atlantic Oceans. These forty-eight states are bordered by Canada to the north and Mexico to the south. "He has favored our undertakings"
"New order of the ages"
Two states are not next to the other forty-eight states. The state of Alaska is in the northwest of the continent. Canada is east of Alaska. Russia is west of Alaska across the Bering Strait. The state of Hawaii is an archipelago in the mid-Pacific. The United States also owns several territories, or insular areas, in the Caribbean and Pacific. The United States is 3.79 million square miles (9.83 million km²). There are about 306 million people living in it. This makes the United States the third or fourth largest country by total area, and third largest by land area and by population. The United States is one of the world's most ethnically diverse and multicultural nations. This is because of large-scale immigration from many countries. The U.S. economy is the largest national economy in the world, with an estimated 2016 gross domestic product (GDP) of US$ 18.57 trillion (23% of the world total based on nominal GDP and almost 21% at purchasing power parity). The nation was founded by thirteen colonies of Great Britain, which was along the Atlantic seaboard. On July 4, 1776, they issued the Declaration of Independence, which stated their independence from Britain and their formation of a cooperative union. The rebellious states defeated Great Britain in the American Revolutionary War, the first successful colonial war of independence. The Philadelphia Convention adopted the current United States Constitution on September 17, 1787; its ratification the following year made the states part of a single republic with a strong central government. The Bill of Rights, comprising ten constitutional amendments guaranteeing many fundamental civil rights and freedoms, was ratified in 1791. In the 19th century, the United States acquired land from France, Spain, the United Kingdom, Mexico, and Russia, and annexed the Republic of Texas and the Republic of Hawaii. Disputes between the agrarian South and industrial North over states' rights and the expansion of the institution of slavery provoked the American Civil War of the 1860s. The North's victory prevented a permanent split of the country and led to the end of legal slavery in the United States. By the 1870s, the national economy was the world's largest. The Spanish–American War and World War I confirmed the country's status as a military power. In 1945, the United States emerged from World War II as the first country with nuclear weapons, a permanent member of the United Nations Security Council, and a founding member of NATO. The end of the Cold War left the United States as the sole superpower. The country accounts for approximately 50% of global military spending and is the leading economic, political, and cultural force in the world. The United States is a federal republic. The federal government of the United States is set up by the Constitution. There are three branches. They are the executive branch, the legislative branch, and the judicial branch. State governments and the federal government work in very similar ways. Each state has its own executive, legislative, and judicial branches. The executive branch of a state government is led by a governor, instead of a president. The executive branch is the part of the government that enforces the law. Members of the U.S. Electoral College elect a president who is the leader of the executive branch, as well as the leader of the armed forces. The president may veto a bill that the Congress has passed, so it does not become a law. The President may also make "executive orders" to ensure that people follow the law. The president is in charge of many departments that control much of the day-to-day actions of government. For example, Department of Commerce makes rules about trade. The president chooses the heads of these departments, and also nominates federal judges. However, the Senate, part of the legislative branch, must agree with all of the people the president chooses. The president may serve two 4-year terms. The legislative branch makes laws. The legislative branch is called the United States Congress. Congress is divided into two "houses". One house is the House of Representatives. The Representatives are each elected by voters from a set area within a state. The number of Representatives a state has is based on how many people live there. Representatives serve two-year terms. The total number of representatives today is 435. The leader of the House of Representatives is the Speaker of the House. The other house is the Senate. In the Senate, each state is represented equally, by two senators. Because there are 50 states, there are 100 senators. The President's treaties or appointments of officials need the Senate's approval. Senators serve six-year terms. The Vice President of the United States serves as president of the Senate. In practice, the vice president is usually absent from the Senate, and a senator serves as president pro tempore, or temporary president, of the Senate. Representatives and senators propose laws, called "bills", in their respective houses. A bill may be voted upon by the entire house right away or may first go to a small group, known as a committee, which may recommend a bill for a vote by the whole house. If one house votes to pass a bill, the bill then gets sent to the other house; if both houses vote for it, it is then sent to the president, who may sign the bill into law or veto it. If the president vetoes the bill, it is sent back to Congress. If Congress votes again and passes the bill with at least a two-thirds majority, the bill becomes law and cannot be vetoed by the president. Under the American system of federalism, Congress may not make laws that directly control the states; instead, Congress may use the promise of federal funds, or special circumstances such as national emergencies, to encourage the states to follow federal law. This system is both complex and unique. The judicial branch is the part of government that interprets what the law means. The Judicial Branch is made up of the Supreme Court and many lower courts. If the Supreme Court decides that a law is not allowed by the Constitution, the law is said to be "struck down" and is no longer a valid law. The Supreme Court is made up of nine judges, called justices, who are nominated by the President and confirmed by the Senate. One of these justices, called the chief justice, heads the court. A Supreme Court justice serves until he or she dies or resigns (quits in the middle of his or her term). When that happens, the president nominates someone new to replace the justice who left. If the Senate agrees with that choice, the person becomes a justice. If the Senate does not agree with the president's choice, then the president must nominate someone else. Famous court cases such as Marbury v Madison (which was decided in 1803) have firmly established that the Supreme Court is the ultimate interpreter of the United States Constitution and has the power to strike down any law that conflicts with it. The United States of America consists of 50 states, 5 territories and 1 district (Washington D.C.). States can make laws about things inside the state, but federal law is about things dealing with more than one state or dealing with other countries. In some areas, if the federal government makes laws that say different things from the state laws, people must follow the federal law because the state law is not a law any more. Each state has a constitution of its own, different from the federal (national) Constitution. Each of these is like the federal Constitution because they say how each state's government is set up, but some also talk about specific laws. The federal and most state governments are dominated by two political parties: the Republicans and the Democrats. There are many smaller parties; the largest of these are the Libertarian Party and the Green Party. People help in political campaigns that they like. They try to persuade politicians to help them; this is called lobbying. All Americans are allowed to do these things, but some have and spend more money than others, or in other ways do more in politics. Some people think this is a problem, and lobby for rules to be made to change it. Since 2017, the president is a Republican, and Congress is also Republican-controlled, so the Republicans have more power in the federal government. There are still many powerful Democrats who can try to stop the Republicans from doing things that they believe will be bad for the country. Also, members of a party in power do not always agree on what to do. If enough people decide to vote against Republicans in the next election, they will lose power. In a republic like the United States, no party can do whatever they want. All politicians have to argue, compromise, and make deals with each other to get things done. They have to answer to the people and take responsibility for their mistakes. The USA's large cultural, economic, and military influence has made the foreign policy of the United States, or relations with other countries, a topic in American politics, and the politics of many other countries. The climate varies along with the geography, from tropical (hot and wet in summer, warm and dry in winter) in Florida to tundra (cold all year) in Alaska. Large parts of the country have warm summers and cold winters. Some parts of the United States, like parts of California, have a Mediterranean climate. The United States conquered and bought new lands over time, and grew from the original 13 colonies in the east to the current 50 states, of which 48 of them are joined together to make up the contiguous United States. These states, called the "lower 48", can all be reached by road without crossing a border into another country. They go from the Atlantic east to the Pacific in the west. There are two other states which are not joined to the lower 48 states. Alaska can be reached by passing through British Columbia and the Yukon, both of which are part of Canada. Hawaii is located in the middle of the Pacific Ocean and is so far from the rest of the US that it can only be reached by airplane. 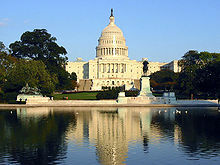 Washington, D.C., the national capital, is a federal district that was split from the states of Maryland and Virginia in 1791. Not part of any US state, it used to be in the shape of a square, with the land west of the Potomac River coming from Virginia, and the land east of the river coming from Maryland. In 1846, Virginia took back its part of the land. Some people living in DC want it to become a state, or for Maryland to take back its land, so that they can have the right to vote in Congress. The Philippines was a possession of the United States. Palau, the Federated States of Micronesia, and other Pacific island nations were governed by the United States as a United Nations "Trust Territory". All of these places have become independent: the Philippines in 1946, Palau in 1947, and Micronesia in 1986. The U.S. armed forces has bases in many countries, and the U.S. Navy's base at Guantanamo Bay was rented from Cuba after that country had a Communist revolution. All the states are divided into administrative subdivisions. Most of them are called counties, but Louisiana uses the word "parish," and Alaska uses the word "borough." There are many cities in the United States. One city in each state is the state capital, where the government of the state meets and the governor works. This city is not always the largest in its state. For example, the city with the most people living in it is New York City in New York State, but the state capital is Albany. Some other big cities are Los Angeles, California; Chicago, Illinois; Seattle, Washington; Miami, Florida; Indianapolis, Indiana; Las Vegas, Nevada; Houston and Dallas, Texas; Philadelphia and Pittsburgh, Pennsylvania; Boston, Massachusetts; Denver, Colorado; St. Louis, Missouri and Detroit, Michigan. The United States has a capitalist economy. The country has rich mineral resources, with many gold, coal and uranium deposits. Farming makes the country among the top producers of, among others, corn (maize), wheat, sugar, and tobacco. America produces cars, airplanes, and electronics. About 3/4 of Americans work in the service industry. The United States of America has people of many different race and ethnic backgrounds. 80% of the people in the United States descend from European immigrants. Many people are descended from Germany, England, Scotland, Ireland, Africa, and Italy. 13% of the people in the United States are African-American. Most of them descend from the African slaves that were brought to America. Asian-Americans make up only 5% of the population in America but make up a bigger portion in the west coast. For example, in California, Asian-Americans make up 13% of the population of that state. Hispanic-Americans or people of Latin origins make up 15% of the nation. The original peoples, called Native American, American Indians, or Amerindians and Inuit (Eskimos) are a very small group. 11% of the people in the United States are foreign born. 18% speak a language other than English at home. For people 25 and older, 80% are high school graduates while 25% have a bachelor's degree or higher. The 2000 Census counted self-reported ancestry. It identified 43 million German-Americans, 30.5 million Irish-Americans, 24.9 million African-Americans, 24.5 million English-Americans, and 18.4 million Mexican-Americans. The social structure of the United States has a big range. This means that some Americans are much, much richer than others. The average (median) income for an American was $37,000 a year in 2002. However, the richest 1% of Americans have as much money as the poorest 90%. 51% of all households have access to a computer and 41% had access to the Internet in 2000, a figure which had grown to 75% in 2004. Also, 67.9% of American families owned their homes in 2002. There are 200 million cars in the United States, two for every three Americans. The debt has grown to over $21,000,000,000,000. There are many different religions in the U.S. Statistically, the largest religion is Christianity, including groups such as Catholicism, Protestantism and Mormonism. Other religions include Hinduism, Islam, Judaism, Unitarian Universalism, Wicca, Druidry, Baha'i, Raelism, Zoroastrianism, Taoism and Jainism. Religions which were founded within the United States include Eckankar, Satanism and Scientology. Native American religions have various animistic beliefs. The United States is one of the most religious countries in the Western World, and most Americans believe in God. The number of Christians in the U.S. has gone down. 86.2% called themselves Christian in 1990 and 78.4% said this in 2007. The others include Judaism (2.3%), Islam (0.8%), Buddhism (0.7%), Hinduism (0.4%), and Unitarian Universalism (0.3%). Those who have no religion are at 16.1%. There is a large difference between those who say that they belong to a religion and those who are members of a religious body of that religion. Doubts about the existence of a God, gods or goddesses are higher among young people. Among the non-religious population of the U.S., there are deists, humanists, ignotic, atheists, and agnostics. The United States does not have an official language, the United States Congress has considered officially designating English as such for many years, since it is the most used language, and the language in which the United States Declaration of Independence and United States Constitution are written. 38 states out of 50 have English as the official language. Spanish has increased in usage in certain sectors of society, due to a flow of immigrants—especially from Mexico and Cuba. French is also a main language in parts of Louisiana because France once owned the area as a colony. American popular culture goes out to many places in the world. It has a large influence on most of the world, especially the Western world. American music is heard all over the world, and American movies and television shows can be seen in most countries. July 4 Independence Day Celebrates the Declaration of Independence; otherwise known as "The Fourth of July"
4th Thursday in November Thanksgiving The autumn harvest, and marks the traditional beginning of the "holiday season"
The American flag is made up of 50 stars on a blue background, and has 13 stripes, seven red and six white. It is one of many symbols of the United States like the Bald Eagle. The 50 stars represent the 50 states. The red stands for courage. The blue stands for justice. The white represents peace and cleanliness. The 13 stripes represent the 13 original colonies. ↑ English is the official language of 32 states; English and Hawaiian are both official languages in Hawaii, and English and 20 Indigenous languages are official in Alaska. Algonquian, Cherokee, and Sioux are among many other official languages in Native-controlled lands throughout the country. French is a de facto, but unofficial, language in Maine and Louisiana, while New Mexico law grants Spanish a special status. ↑ George McKenna 2007, p. 280. ↑ Kidder & Oppenheim 2007, p. 91. ↑ "uscode.house.gov". Public Law 105-225-Aug. 12, 1998. uscode.house.gov. August 12, 1999. pp. 112 Stat. 1263. Retrieved September 10, 2017. Section 304. "The composition by John Philip Sousa entitled "The Stars and Stripes Forever" is the national march." ↑ Cobarrubias 1983, p. 195. ↑ García 2011, p. 167. ↑ I fem territorier er engelsk sammen med et eller flere indfødte sprog officielle: spansk i Puerto Rico, samoansk i Amerikansk Samoa, chamorro i både Guam og Nordmarianerne. Caroliansk er også et officielt sprog i Nordmarianerne. ↑ "U.S. Census Bureau QuickFacts selected: UNITED STATES". QuickFacts. U.S. Department of Commerce. July 1, 2016. Retrieved September 11, 2017. ↑ Cox, Daniel; Jones, Ribert P. (June 9, 2017). "America's Changing Religious Identity". 2016 American Values Atlas. Public Religion Research Institute. ↑ Areas of the 50 states and the District of Columbia but not Puerto Rico nor (other) island territories per State Area Measurements and Internal Point Coordinates, US Census Bureau, August 2010, retrieved November 17, 2017, reflect base feature updates made in the MAF/TIGER database through August, 2010. ↑ "Population estimates, July 1, 2017, (V2017)". US Census Bureau. ↑ "Annual Estimates of the Resident Population: April 1, 2010 to July 1, 2016". United States Census Bureau. Retrieved July 25, 2017. The 2016 estimate is as of July 1, 2016. The 2010 census is as of April 1, 2010. ↑ 12.0 12.1 12.2 12.3 "World Economic Outlook Database, April 2018 – Report for Selected Countries and Subjects". International Monetary Fund (IMF). Retrieved April 1, 2018. ↑ "OECD Income Distribution Database: Gini, poverty, income, Methods and Concepts". Organisation for Economic Co-operation and Development. Retrieved September 29, 2017. ↑ "2016 Human Development Report" (PDF). United Nations Development Programme. 2016. Retrieved March 23, 2017. ↑ Se Tid i USA for detajler om lovene om tidszoner i USA. ↑ Bortset fra Amerikansk Samoa og de Amerikanske Jomfruøer. ↑ Adams, J.Q. ; Strother-Adams, Pearlie (2001). Dealing with Diversity: The Anthology. Kendall/Hunt Publishing Company. ISBN 978-0-7872-8145-8. ↑ "World Economic Outlook Database". International Monetary Fund. October 2008. Retrieved 2008-10-27. ↑ Greene, Jack P.; Pole, J.R. (2003). A Companion to the American Revolution. Blackwell Publishing. p. 352. ISBN 978-1-4051-1674-9. ↑ Cohen, Eliot A. (July/August 2004). "History and the Hyperpower". Foreign Affairs. Retrieved 2006-07-14. Check date values in: |date= (help) "Country Profile: United States of America". BBC News. 2008-04-22. Retrieved 2008-05-18. ↑ Kosmin, Barry; Keysar, Ariela (2009). "American Nones: The Profile of the No Religion Population" (PDF). Trinity Colloge. ↑ "United States Facts - Ten Interesting and Unusual United States Facts". Geography. Retrieved 9 August 2013. ↑ "2014 Federal Holidays". U.S Office of Personnel Management. Retrieved 26 January 2014. Portrait of the USA - Published by the United States Information Agency, September 1997. US Census Housing and Economic Statistics Updated regularly by US Bureau of the Census.